Summer is a season everyone is eagerly waiting for, and summer themed slot machines have a similar attraction among online slots players across the world. Our dedicated staff here at MoneyReels played almost every available game on the theme of summer and ranked them for the benefit of the players. We have based our rankings on the RTP, ease of playing, rewards, and user experience among the many factors considered in selecting the Top 5 Summer Themed Slots. A detailed analysis of each game is available in the MoneyReels games library. It’s that time of the year when you eat an ice cream just relaxing on the beach, or play a game under the warm sun. And with Sunny Money you will be doing just that, and earn some sizable prizes too. 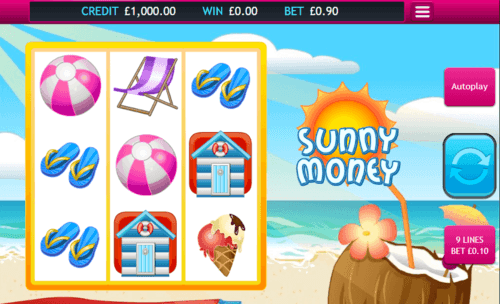 Sunny Money 3x3 slot machine with 9 paylines has focused much on visual entertainment so that you could enjoy summer in abundance. Up to a massive 20,000x prizes and 25 Free Spins are the features to take note of. We ranked this number 5 in our list of Top 5 Summer Themed Slots. You can go to the tropical paradise if you are up to it, and spend a summer to remember for the rest of your life. 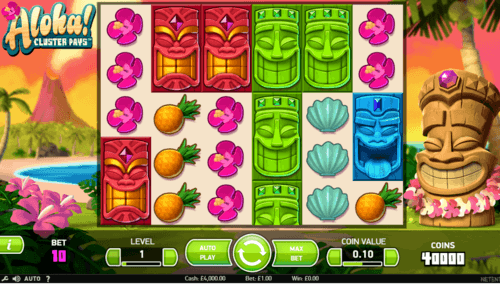 Creating wins on 27 paylines, Sunny Shores online slot is this paradise themed slot game has an RTP of 96.2%. A maximum bet of £125 is available for the high roller but if you wish to play this game for fun then a minimum bet of £0.10 would be great news. The Expanding Wild which could expand vertically or horizontally will make sure to award you more winning chances. 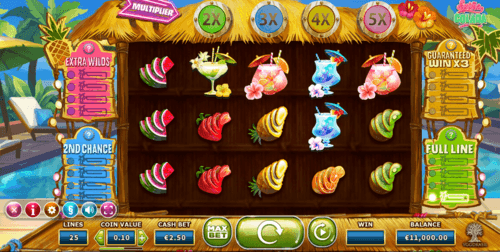 With an RTP of 96.30% Sam on the Beach slot game assures you justice whatever stake level you play at. A minimum of £0.20 or a maximum of £100 could be your bet, but the entertainment and rewards are equally awarded. The Graphics are excellent with the whole screen as background on which the symbols drop in an avalanche. Free Spins and Respins may give you additional chances but you can also change your betting style on the Optimizer, Leveller, Booster, and Jumper modes. Take your Spina Colada, go to the beach, and enjoy all the beauty the paradise has to offer while the reels decide how much you would take home as prizes. A theoretical RTP of 96.3% would make sure that you are rewarded for your efforts, and there is a maximum available prize of £400,000. Column Multiplier, Second Chance, and Full Line are some of the highlights of this feature packed slot machine which we have ranked number 1 in our list of Top 5 Summer Themed Slots.